Figure 1. 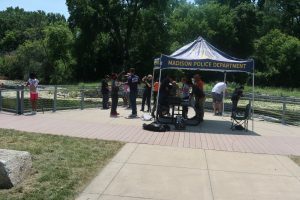 Fishing spot at Wingra dam for Madison police CORE program. Sounds of delight were heard as students from Toki middle school caught fish in the waters around the Lake Wingra dam (Figure 1). The fishing action was steady with Wingra’s large supply of pan fish. 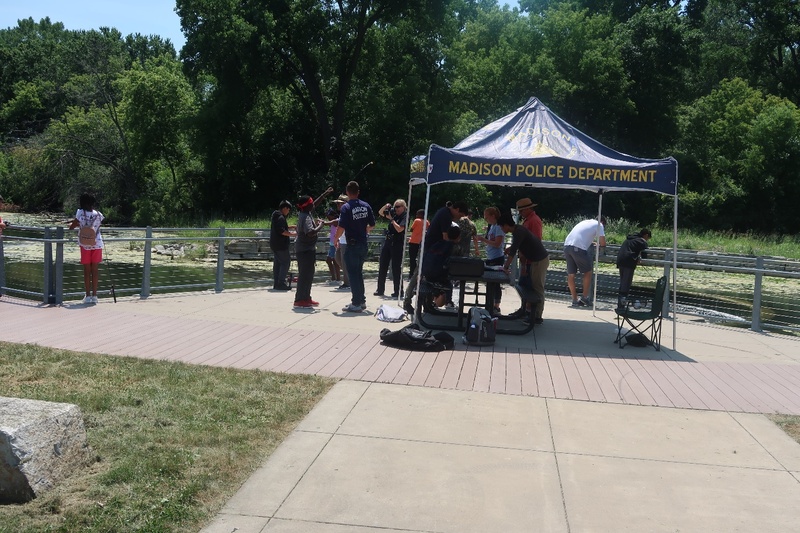 The students’ opportunity to fish at Lake Wingra was supported by the City of Madison Police Department’s Community Outreach and Resources Education (CORE) program. According to Sergeant Kleinfeldt, other participating schools will have the opportunity to fish at Wingra in the coming weeks. For more information about CORE, visit their website: https://www.cityofmadison.com/police/community/core/. Just a short distance from the lake a zoo volunteer, Dave, was describing the habits of a very large snake to zoo visitors. Dave warned visitors to not try to stare down a snake, because they do not have eye lids – they don’t blink (Figure 2). Figure 2. 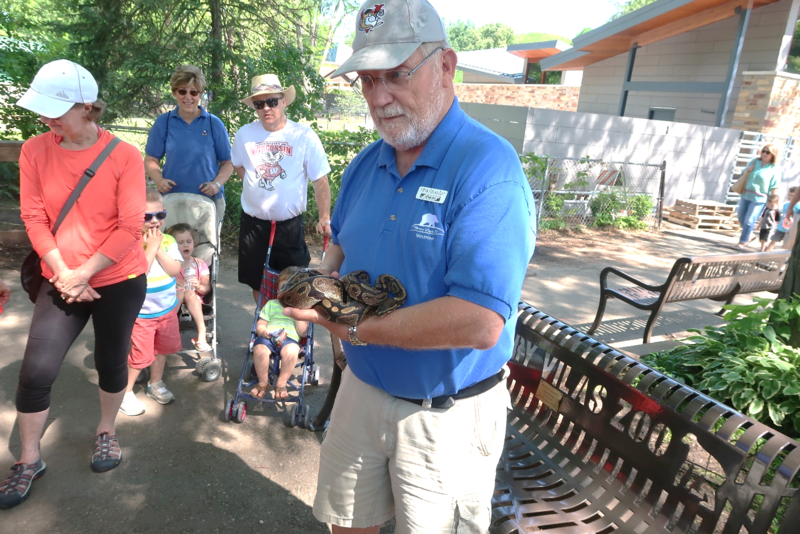 Dave showing snake to zoo visitors. On July 28 your volunteer monitoring team measured a decline in lake clarity and temperatures since July 6. Secchi readings dropped from 4 feet to 2.5 feet, while temperatures declined about 4 degrees to 76 degrees. Diminished water clarity did not seem to discourage the use of the lake, because your team counted over 30 water craft on the lake while traveling between sampling sites! The beautiful weather helped bring lots of people out to enjoy the lake. Also, the new fishing pier by Vilas Park was very busy (see featured image above).